On a recent climbing trip, I tried out the PlatyPreserve Wine Preservation System which a reader recently inquired about. Platypus is the brand name for a series of hydration systems made by Cascade Designs, a Seattle-based, outdoor gear company. With the PlatyPreserve, Cascade Designs makes a variation on its popular hydration system by making the soft plastic bag semi-opaque and adding milliliter markings along the side. The bag has a small spout on the top for filling, pouring, and cleaning. The intent of the device, as the name would suggest, is to assist with the preservation of wine. This is done by adding wine to the bag and removing oxygen. 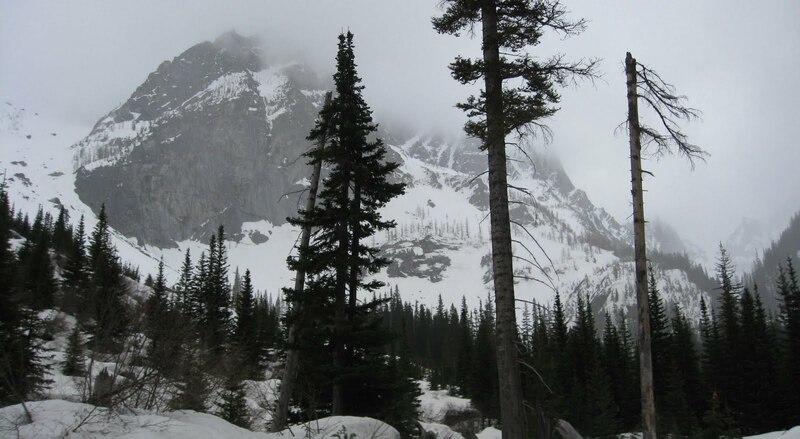 An alternate and obvious use is to carry wine in to the backcountry or other places where having a glass bottle is not practical. There are a variety of wine preservation systems out there, many of which work by minimizing wine’s exposure to oxygen. These include using vacuum pumps to remove oxygen and adding inert gas to displace oxygen. The PlatyPreserve system, on the other hand, works by simply pushing any remaining air out of the bag and sealing the bag. As a preservation system, the PlatyPreserve is somewhat mixed. While the PlatyPreserve says it works by “completely eliminating the presence of oxygen,” this is, in fact, quite difficult to do. If a full 750ml bottle of wine is added, the only way oxygen can be removed is by tilting the bag to the side and adding the cap – not particularly difficult. However, if smaller amounts of wine are added to the bag, the only way to remove the air is to push the air up through the spout and then add the cap. This is, at best, a bit awkward as the spout is on the top corner of the device. The bag must ideally be tilted while pushing the sides together to remove oxygen and then the cap must be added. Three hands would be helpful here. 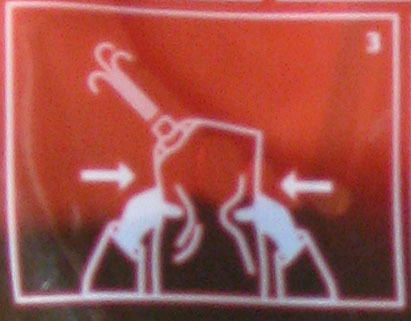 Additionally, there is the possibility of squirting wine in all directions if one follows Step 3 of the instructional pictures and pushes on both sides of the bag to remove oxygen. I think they were intending to show air in the picture but one can imagine otherwise. People familiar with another Cascade Designs product, the Therm-a-Rest, might wonder why the PlatyPreserve doesn’t have a similar type of valve to the Therm-a-Rest which allows for the removal of air when deflating the sleeping pad. For the PlatyPreserve, Cascade Designs would ideally make a valve that would allow oxygen to be pushed out without letting wine escape. This would be somewhat more expensive to produce. However, it would make the PlatyPreserve considerably more useful as a preservation system. No matter. While the PlatyPreserve is billed as a preservation system, its more logical to use it to carry wine in to far away places. In this, the PlatyPreserve does extremely well. It is lightweight, packs well, and pours easily. The plastic does not appear to impart any taste to the wine. Paired here with a govino glass, the system provided a perfect way to while away the hours while the snow fell on our climbing route. Ultra-light folks can ditch the glass. In terms of cleaning, the PlatyPreserve is supposed to be rinsed with water and turned upside down to drip dry. 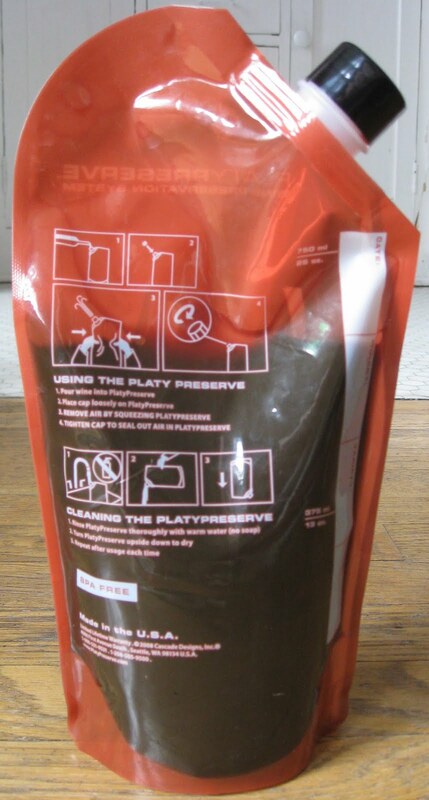 Given that the only way to access the inside of the bag for cleaning is through the small nozzle on the top, if the bag truly became dirty, a dedicated cleaning device would be required, much like the Platypus. Overall, the PlatyPreserve is moderately useful for those looking for a preservation system. While I did not do a side-by-side comparison to other preservation systems, the ease of use in removing all oxygen limits its utility. For those looking for a way to bring wine somewhere while leaving the bottle at home, look no further. The PlatyPreserve retails for $9.95. I use the Platypus for a slightly different purpose. I am always dragging bottles of wines around for tasting events and dinners. Such events are not the most conducive to really writing up a wine. Also I often like to see what a wine is like the next day but I don't want to drag all those bottles back home again. I bring along a bunch of platypus (I got a 4 pack at Amazon for $25 last fall) and put the leftover wine in those to take back home for future review. I have done some testing in terms of preservation and it varies according to the wine. Cote Bonneville lasted a solid week as I treated myself but some other wines were toast after 3 days. I'd give them A- for transport (a funnel is needed if your wine is precious) and B- for preservation but better than none. Huh? 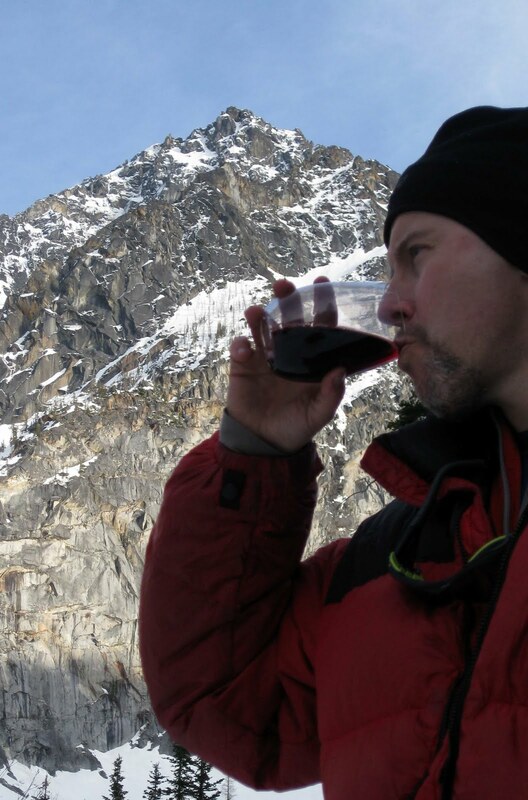 Just who takes wine up on a hike? Are you kidding me? A hiker is already sweating and huffing, losing all that volume, then to go and drink an alcoholic beverage in a hypovolemic condition? Well, I hope those people are walking back down along the edge of a cliff. Makes no sense. Gatorade, I can understand. Wine of any genre...that sounds lame. ~WAwineman. Seem like a good idea for travel, if you check your bags. I always carry wine when I travel, but the weight of the bottles always adds to the cost of my luggage...If it does not impart a platic taste to the wine, It is probably a very good idea. Hiking or biking, no way!!!! Bean, good point on storing multiple leftover bottles of wine. WWM, hike? Climb! 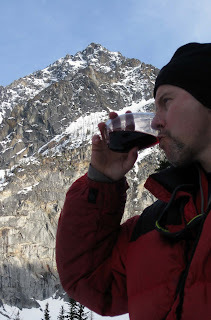 Wine and beer is an essential element of climbing. Anon, *very* good idea for using it during airplane travel. I always hate taking wine unless it's boxed. HA! Finally a glass for the winery! I can't tell you how many glasses I've broken during harvest when they fall off the press, get hit by a forklift, jump magically off a ledge. Perfect. Greg, the govino glass is pretty damn good. Modeled on the O series but with a nice indentation for your thumb. Enjoy! WAwineman I just loaded up my platy-preserve for 3 days in the back country over in the Olympics. I hydrate all hike with my camel bak, but like Sean says, you get to camp, kick back and drink a nice wine by the fire, why wouldn't you want to do that? If only they could figure out a similar system to preserve beer. Clive, I think we have a business opportunity here. The BotaBeer!